Global plastics recycler receives international recognition – three times in a week. Almost 20 years to the day after the company started life in a garage in California, MBA Polymers, the world-leading plastics recycler has been awarded two prestigious international awards in just seven days. Additionally, SHFT.com released an exciting 3 minute documentary video on MBA Polymers as one of the 10 innovators leading important change around the world. Last Tuesday, (December 4th), Dr Mike Biddle, President and Founder of MBA was awarded the 2012 Gothenburg Award for Sustainable Development – widely recognised as the Nobel Prize equivalent of the environmental world. The theme for this year’s award was ‘closing-the-loop’. Compared to nature’s own eco-cycle in which waste products are valuable in new processes, society’s current use of resources is unsustainable. It is estimated that less than 10 per cent of plastics in the world are recycled. Raw materials are converted into products and eventually become waste, leading to resource shortage, waste problems and energy waste. Entrepreneurship and new innovative solutions are required to break this trend and instead create functioning eco-cycles. The Gothenburg Award winner in 2011 was former UN Secretary General, Kofi Annan. Amongst previous winners were Al Gore (2007) and the former Prime Minister of Norway and Director General of the World Health Organization, Gro Harlem Brundtland. 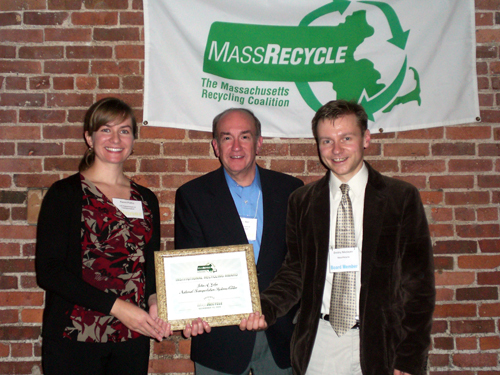 On November 27 MBA was named GoingGreen’s ‘Company of the Year’. This was announced at AlwaysOn’s annual GoingGreen event at the end of November. It followed MBA’s selection as one of the GoingGreen Silicon Valley Global 200 winners signifying leadership amongst its peers and game-changing approaches and technologies. MBA was specially selected by the AlwaysOn editorial team and industry experts spanning the globe based on a set of five criteria: innovation, market potential, commercialisation, stakeholder value, and media buzz. The film was produced by SHFT co-founders Peter Glatzer and Adrian Grenier and sponsored by Ford Motor Company. SHFT is a multi-media platform whose mission is to convey a more sustainable approach to the way we live through video, design, art and culture. As filmmakers concerned with climate change, their wish is to bring something creative to express the changes they wanted to see and were, gratefully, starting to observe. Video, art and design are powerful and inspiring ways to convey this narrative. Mike Biddle commented, “This has been an extraordinary week in the history of the company and a great honour to be recognised in the way we have. Over 20 years we’ve now grown to become the world’s leading multinational company recovering plastics from end-of-life durable goods, such as computers, electronics, business equipment, appliances and automobiles. With over 300 million pounds a year processing capacity across the world in the US, Europe and China, turning waste into recycled plastics, we are now really starting to ‘make a difference’ and close the loop in this important environmental and economic area. “I started the business from my garage in the San Francisco Bay Area almost 20 years to the day and who would have thought that we would have achieved such recognition in that time. What a great way to celebrate our 20th birthday!